Forever 21 came through again. I scored this leopard fold over clutch for less than twenty dollars and can already tell it is going to be a new staple in my bag collection. Who could possibly resist this steal of a deal? Sorry in advance if you get tired of seeing it pop up on my blog, but it's just that good. Leopard has always been a neutral to me, just ask my college friends, they will tell you how big my heart has always been for this print. And yes, I am wearing another maxi dress. I am telling you, I just can't get enough of the most comfortable pieces ever created by man. I could live in them 24/7. I think this one from Kiki La'Rue could quite possibly be my all-time favorite. I wore this yesterday running errands while trying to find the exact size manilla and colored construction paper for Landry's back to school supply list. As we were leaving Office Depot, the greeter at the front door said to me, "I need one of those dresses. Where did you get it? It looks so comfy, like a stylish night gown." Of course I told where it came from and did my little "schpeel" on Kiki La'Rue. Now, I wasn't too sure about the night gown part, but I guess I will take what I can get. Seriously ladies, if you haven't checked out Kiki La'Rue you are missing out. Becka, the owner, really does find the best of the best when it comes to product; pieces that fit and flatter every shape and size. 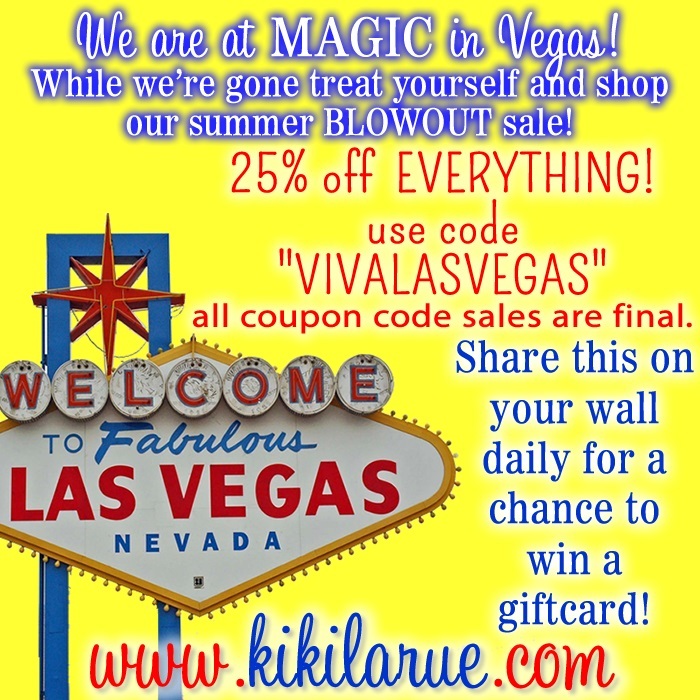 The great news is while she is away in Vegas, shopping for all of us at Magic Market Week, everything is 25% off. Yes, the entire online shop is on sale. If you are a frequent buyer, have made 10 purchases or more, you will receive an additional 5% off your order for a total of 30% in discounts. In case you don't already know, this is a super special deal because Kiki La'Rue doesn't typically run these types of flash sales. So get to gettin' while the gettin' is good. Not only do you ladies get this fabulous discount, but you all have the chance to win a $50 gift card to Kiki La'Rue along with the lion bracelet I am wearing in today's post. This prize package totals almost $75. The sun kiss high low dress is so pretty! And you outfit - LOVE! The color is so pretty with the leopard clutch. I agree this is such an awesome deal. I just got mine in the mail and used it right away. I would get the Druzy drop earrings in peach. i want a champs maxi! though you are really rocking the morgan. i like it too! I love the Odessa Ombre mint top! And your lion bracelet is the best! I would get the Unity maxi. Love the maxi, denim jacket, and leopard combo! LOVE! I would get the Christina skirt. I've wanted a maxi skirt for a long time and that is perfect! Everything on their site is so cute! But I think I'd get the Far and Away necklace - perfect for my wedding! i would get the day at the office short sleeve top!! I absolutely love the color of this maxi dress. It's one that you can totally wear into the fall no problem. LOVE that clutch. You look gorgeous my friend! How perfect are the dress and clutch as transition to fall pieces! Rock it out girl. You look so gorgeous! this is one of my favorite colors for fall...and it was actually my high school's colors growing up, so I'm surprised I'm not sick of it yet! I'm loving the burgundy and animal print combination! And I seriously need to check out Kiki La'Rue! I love the Bristol Tunic and the Odessa Ombre Boyfriend top in coral! I love the Pico tunic! Maroon is a gorgeous color on you Shanna! I would get a new maxi dress if I won...I need a new one in my closet!! You look so cute! I totally wear stuff over and over on my blog. I think it is smart to get the most use out of something that you can. Love your look! I love the rich plum color of that maxi....it's the perfect transition maxi dress esp. when mixed with the jean jacket you have on!!! I ordered this dress on Sunday once I saw that sale, I can't wait to get it! I would definitely order another maxi dress if I won, probably the Champs maxi and would have a hard time picking a color! Girl, you're gorgeous!! If I won, I would get Layton leopard trimmed top that I've been eyeing for a while. I LOVE everything in that store. You look ready for fall, Shanna! I love the burgundy color of that maxi! I'd get the Ariel Dress if I won. Love the color of the maxi dress & the fold over clutch. It's on my list of things I want to buy. I would love the "slimming lines sleeveless top in navy/white!" You could SO wear this to a TX State game this fall!!!! Love the look girlie! I love the Damask Tunic Dress! I like the Oh Thank You necklace! Definitely the A Lil bit of Sas Peplum Top! The Christina skirt would be my option for sure! I love the hippie maxi dress! So cute! 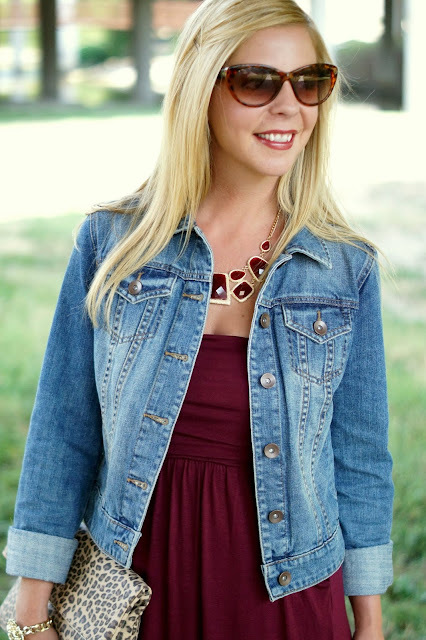 I am loving the burgandy and leopard, I think that's going to be HUGE this fall:) Cute denim jacket too! I have one, but it just doesn't seem to fit me right...I will have to look into this one! I would get the Slimming Lines Sleeveless Top in Navy/White stripes. I LOVE THIS LOOK! SO perfect for fall-gorgeous! I want the Morgan Maxi in Purple or the sweater with the heart. Love both! I JUST got my first Kiki La'Rue dress and I LOVE it! So I may totally have to copy you and snag that clutch too. Great find! And you look effortlessly chic here lady! I would love the California Girl Hi Low Dress in Dark Coral! I would get the little bit country dress in navy. I love the hippy chic maxi! I would definitely get that or another maxi. I would get the Taylor Tank Dress-Black/White. girl you are getting dressed for fall too! I am loving the color combination.. perfection! Miss your pretty face, hope those girls of mine are excited to start school up! I need a maxi in my life! that maroon looks perfect on you! LOVE the Morgan Maxi in Taupe! Love the bed of roses top! I love the All Wrapped Up Skirt! Loving the Bristol Tunic and different striped tanks. This maxi dress is gorgeous, I love it with the denim jacket and that necklace! I would choose the belle of the ball maxi in black since I seem to not be able to get dressed without a maxi on these days! Love the maroon maxi on you, so pretty! That color looks GOREGEOUS on you! The clutch really ties the whole look together! Lately I've been wearing my denim jacket with all of my maxi dresses. Perfect way to transition them into the fall! I love that you added a statement necklace in the same bold color as the maxi. You look wonderful! I might have to grab that perfect clutch for myself... I've been looking for a clutch for so long now! Cheers! Love the color of this maxi on you! Absolutely stunning! I love the Shelby dress in mint! I need a dress for a wedding in October and I've been looking at the Simply Stunning dress. Hopefully they restock! LOVE the dress. Maxi's are AMAZING. That color is gorgeous!! It's like a crisp nod to fall. Love it and I need that clutch. Aw she has such bad customer service reviews, I'd be afraid to get anything. That clutch though, so cute! I need one! you are one hot momma!! I think I would get the Hailey or Marisa striped dress. Could totally transition either into fall. You look awesome in that outfit! The mint drop earrings and Drops of Jupiter necklace in green are STUNNING! Love the outfit! YES on maxis being the most comfortable thing every, and YES on the clutch! I saw it at Forever 21 and worked HARD to resist, but you aren't helping me Shanna! Oh, and I love the B. Cox express maxi! I LOVE the adorable Bowdacious Maxi - Navy and khaki !!! I am all about the maxi - your outfit is fab. Love the leopard and denim with the deep burgundy. So hard to choose, but I'm eyeing the Taylor tank dress in mint and lilac! The unity maxi would be my pick! I like Eve's tank in black. I'd get the Champs Tube Top Maxi - Black and Mint. I'd get one of their maxi dresses for sure! I love your matching dress and necklace here! I would spend it all on jewelry...and go crazy deciding which pieces! Love the secret garden party maxi in taupe...thanks for the chance to win! I want a black and mint champs dress BUT I am so excited for the fall goodies they are bringing back from Vegas!! Such a pretty dress and I love your fun clutch lady!! You look lovely! I really like the color of your dress. Every time I open your blog I find the look that is even more gorgeous than the previous one!!!! Love this maxi!!!! I love the South by Southwest Tank top in Black! I would go for the As the Tide Rolls Shift Dress in Blue. 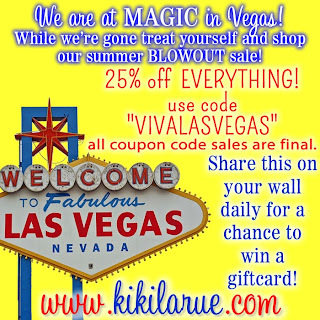 There are some cute items over at Kiki La Rue! i would love to get this if i won :) http://www.kikilarue.com/marilyn-white/ very classy! I would get the Lime Design Necklace....love, love, love it!! Gorgeous! I love the necklace it goes perfectly with the dress. This is my favorite fall color! I love the Lil Bit Country dress in yellow. Thanks for the giveaway! The Surrender the Love Dress is really cute! I'd get the bow me away tank! I've had my eye on the bowdacious maxi for a long while! there is an adorable anchor tank top on the site that I would snag! And maybe a new maxi too! Great outfit, again! I might have to add that leopard clutch to my next F21 order, looks like it would be a versatile fall piece! I LOVE the maxi you are wearing!! I want that necklace you styled, so pretty! I love the Alexis Aztec Top. Thanks for the giveaway! I'd get a Modest Dress, although the stuff Becka is getting for fall looks amazing! I like the A Lil Bit Country dress in navy! The Breezy Anchor Top is BEAUTIFUL! I would love to have that one! Their seamless Bandeau looks super comfy...I can never have too many bandeaus! And the Alexis Aztec Mini Dress is super cute! And the Girl Power Tank...I better stop now or I'll go on forever! I love their pieces! Thanks for the giveaway! I'd get the Fun House Dress, I LOVE it! Love the frenchie top! You are gorgeous! I would love to have the Blue Cactus maxi dress! SO cute!! I'd love the dress you're wearing - the color is so gorgeous! But, all the stuff that they got at market looks amazing too! I would get the drops of Jupiter necklace in green. I would get the Hippie Chic Maxi dress!! Love the clutch!! And for the price, it looks amazing! !